‘an acme blend of science and psychology that’s likely to disturb many orthodox physicists but delight the audience for which it was written’. Quantum science applies to us all. Far from being a slurry of wizardly gobbledegook, quantum law is in fact based on straightforward, understandable principles. Scientists love to mask the subject in mystery, and don’t generally apply quantum to human beings. Quantumology presents primary quantum principles in an easily digestible format to unearth some bright gems of information we can fruitfully use to help further our own quality of life. During the talk, simple table-top experiments will demonstrate how quantum factors apply to everyday living, and the discussion will reveal how we can utilise quantum principles in creating the kind of life we want to lead. 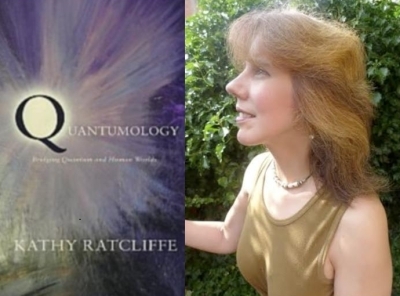 ‘Quantumology’ is published by Matador and Kathy will have copies on sale and to sign.